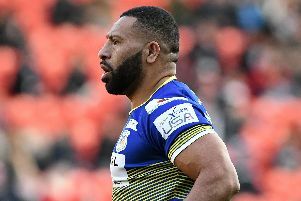 Doncaster RLFC survived an early shock to book their place in the fourth round of the Ladbrokes Challenge Cup with a 34-6 win over Humberside amateurs Myton Warriors at the Keepmoat Stadium. Warriors made a sensational start - stand-off Nathan Slater taking advantage of hesitancy in the Doncaster defence when touching down from his own kick just before the ball rolled dead to score a 90 second try converted by centre Ash James. But the Dons, who had several players on debut as head coach Gary Thornton lived up to his promise to give his full squad the chance to impress before the start of the club’s League One campaign, hit back with four unanswered tries to lead 22-4 at the break in what was to prove their best attacking spell of the game. A good break down the right touchline by winger Louis Sheriff helped create the field position from which Kieran Cross scored from close range on five minutes. The Dons remained on the attack and centre Jason Tali crashed over for following some snappy handling in the Myton 20. Carr again added the extras to make it 12-6 after ten minutes. The lively Cross got centre Chris Heil away and he used his strength to reach out of the tackle to score a third converted try as the Dons extra pace and power continued to take its toll on the game amateurs. Little had been seen of the National Conference League Premier Division side in attack since their earlier heroics and they fell further behind on 25 minutes. Winger Aaron Jones-Bishop produced a spectacular dive to score in the corner following a neat handling move initiated by scrum-half Jack Miller, who, like Cross, showed some nice touches. Myton, who were unlucky not to score a second try on the half-hour, enjoyed the better of the territorial exchanges in the last ten minutes of the half during which time they mixed their tactics well. It took the Dons, who had previously gone close through Jones-Bishop and Carr, most of the third quarter to extend their lead – Cross sending second-rower Liam Welham over from close range for a 57th minute converted try to make it 28-6. Myton continued to pose problems at the other end from time to time and showed no signs of ‘blowing up’ as the game entered its final quarter. But they conceded a sixth try on 67 minutes. Carr, who also added the extras, going over from acting half-back. The home side looked all set to score again a couple of minutes later but the cover got across to nail Cross. The Dons, who still have things to work on, again had to dig deep to deny the visitors. Dons: Carr, Sheriff, Heil, Tali, Jones-Bishop, Cross, Miller; Castle, Kesik, Scott, Welham, Worrincy, Muranka. Subs:Wright, Spiers,Paleaaesina, Aizue. Myton Warriors: Hill, Wheeldon, Precious, Ash James, Lee James, Slater, Walker,Pearce, Newton, Garnett, Halstead, Jennison, Fewlass. Subs: Ward, Shaw, Spencer,Johnson.